The 2005 James McTeigue and Wachowski Brothers film V for Vendetta represents a postmodern pastiche, a collection of fragments pasted together from the original Moore and Lloyd graphic novel of the same name, along with numerous allusions to literature, history, cinema, music, art, politics, and medicine. Paralleling the graphic novel, the film simultaneously reflects a range of authorial contribu… tions and influences. 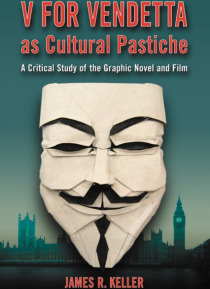 This work examines in detail the intersecting texts of V for Vendetta. Subjects include the alternative dimensions of the cinematic narrative, represented in the film's conspicuous placement of the painting The Lady of Shalott in V's home; the film's overt allusions to the AIDS panic of the 1980s; and the ways in which antecedent narratives such as Terry Gilliam's Brazil, Huxley's Brave New World, and Bradbury's Fahrenheit 451 represent shadow texts frequently crossing through the overall V for Vendetta narrative.